Welcome - Website of antholisart! Our artwork is in private collections around the world. Examples include: Australia, France (Dieppe, Greges, Ile Tudy Bretagne, La Rochelle, Paris, Pommereval, ), Canada, Germany, Mexico, and nine states in the United States (California, Florida, Illinois, New Jersey, New York (Rochester, Rego Park), North Carolina, Oregon, Pennsylvania, Texas). Ernie studied photography at the New York Institute of Photography. Upon earning a degree in finance, his career was in banking and finance in major New York institutions. As an artist, he studied oil painting at New York University and the New School in New York City. In 2005, Ernie returned to photography and since 2008, he has studied pastels. Ernie has won awards for both his photography and pastels and has been accepted into many juried exhibits, including the Brookdale Community College Art Show (2009; 2010) and the Monmouth Festival of the Arts (2011). Ernie's art has been featured in newspapers and magazines and he has exhibited in many libraries and galleries in NJ. His paintings and photography feature nebulas, landscapes, seascapes, and color abstractions. Ernie volunteers his administrative, financial, and marketing skills to support art guilds and societies in Monmouth County, NJ. Ernie is the Co-President of the Art Society of Monmouth County and "Oldies But Goodies" Anniversary Exhibit Chair for the Art Society of Monmouth County and has been a member of the ASMC since 2010. 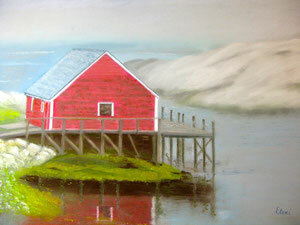 FIRST PLACE Professional Pastels for "Lobster Houses, Nova Scotia"
SECOND PLACE Pastels for "Blue"
FIRST PLACE Pastels for "Coming Ashore"
HONORABLE MENTION Pastels for "Tropical Island"
THIRD PLACE Pastels for "Delphinium"
FIRST PLACE Pastels for "Lobster Houses, Nova Scotia, Canada"
FIRST PLACE Pastels for "Mountain Sunburst"
THIRD PLACE Pastels for "Birches"
FIRST PLACE Pastels for "Purple Mountain"
SECOND PLACE Pastels for "Field of Poppies"
THIRD PLACE Pastels for "Sun & Surf"
HONORABLE MENTION "Old Town Mykonos"
HONORABLE MENTION - "Monument Valley, AZ"
Helen, associate member of the prestigious Pastel Society of America since 2011, is an award-winning artist who expresses the beauty of what she sees through various mediums. Under the tutelage of Sangita Phadke, PSA, Helen studied pastels. 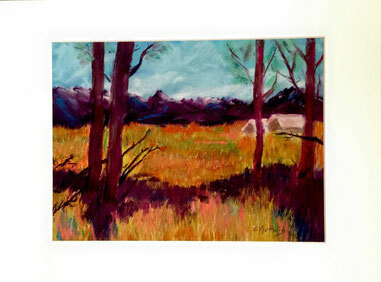 Whether it is with pen & ink, watercolor pencils, oils, or pastels, Helen enjoys learning and growing through her art. Helen is the founder and curator of Brookdale Community College's first public art gallery in Freehold, NJ from 2006-2008 where she was the charter director of that campus. Helen is the Digital Communications Director of the Art Society of Monmouth County which she joined in 2011. Helen signs her pastels as "Eleni", her Greek name. Helen has been accepted into juried art shows at Brookdale (2009; 2010) and the Guild of Creative Art in 2010. Helen is Co-President of the Art Society of Monmouth County. THIRD PLACE Professional Pastels for "La Serviette"
SECOND PLACE Pastels for "Two Pears and an Apple"
PARTICIPANT - Self-Portrait Mirror: "I'm Priceless"
THIRD PLACE Pastels for "Moon Over Delos"
THIRD PLACE Pastels for "The Gold Rim"
SECOND PLACE Pastels for "Varanasi"
SECOND PLACE Pastels for "Liberty Bowl III"
FIRST PLACE Pastels for "Liberty Bowl"
HONORABLE MENTION Pastels for "Day's End"
SECOND PLACE Pastels for "Grand Canyon Sunset"
SECOND PLACE Pastels for "Mandarin Reflections"
HONORABLE MENTION Pastels for "Oranges"